Biotinylated Mouse VEGF120, His Tag (VE0-M82Q2) is expressed from human 293 cells (HEK293). It contains AA Ala 27 - Arg 146 (Accession # Q00731-3). The protein has a calculated MW of 17.3 kDa. The protein migrates as 22-24 kDa and 24-26 kDa under reducing (R) condition (SDS-PAGE) due to glycosylation. 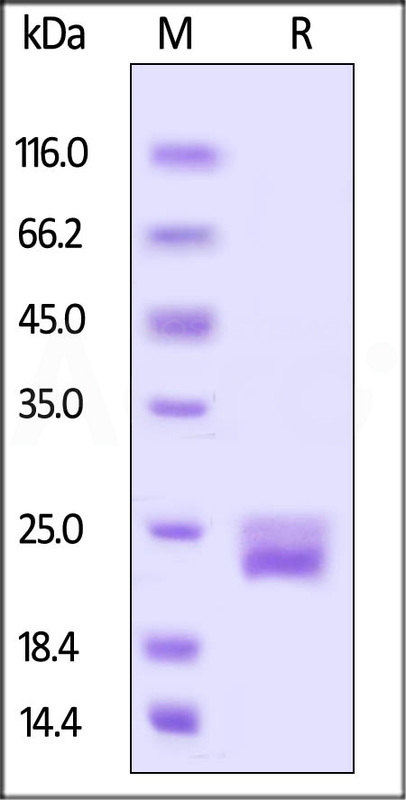 Biotinylated Mouse VEGF120, His Tag on SDS-PAGE under reducing (R) condition. The gel was stained overnight with Coomassie Blue. The purity of the protein is greater than 95%. 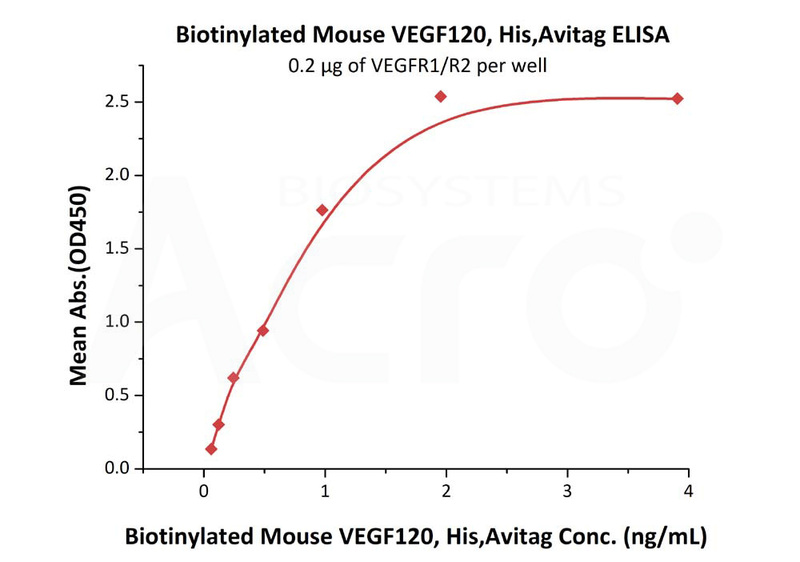 Immobilized VEGFR1/R2 at 2 μg/mL (100 μL/well) can bind Biotinylated Mouse VEGF120, His Tag (Cat. No. VE0-M82Q2) with a linear range of 0.06-2 ng/mL (QC tested). 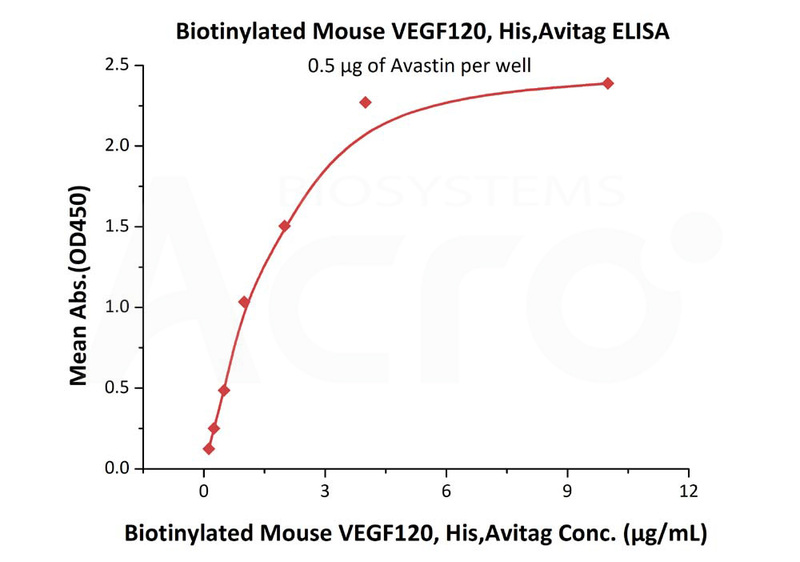 Immobilized Avastin at 5 μg/mL (100 μL/well) can bind Biotinylated Mouse VEGF120, His Tag (Cat. No. VE0-M82Q2) with a linear range of 0.125-2 μg/mL (Routinely tested). Vascular endothelial growth factor A (VEGFA) is also known as Vascular permeability factor (VPF). VEGFA belongs to the PDGF/VEGF growth factor family. VEGFA is a glycosylated mitogen that specifically acts on endothelial cells and has various effects, including mediating increased vascular permeability, inducing angiogenesis, vasculogenesis and endothelial cell growth, promoting cell migration, and inhibiting apoptosis. Alternatively spliced transcript variants, encoding either freely secreted or cell-associated isoforms, have been characterized. VEGFA is produced by a group of three major isoforms as a result of alternative splicing and if any three isoforms are produced (VEGFA120, VEGFA164, and VEGFA188) then this will not result in vessel defects and death of the full VEGFA knockout in mice. (1) Shin S.-Y., et al., 2005, Yonsei Med. J. 46:679-686. (2) Breier G., et al., 1992, Development 114:521-532.